Mammoet Road Cargo – member of the Big Move Group – is very happy to announce it is expanding its fleet! 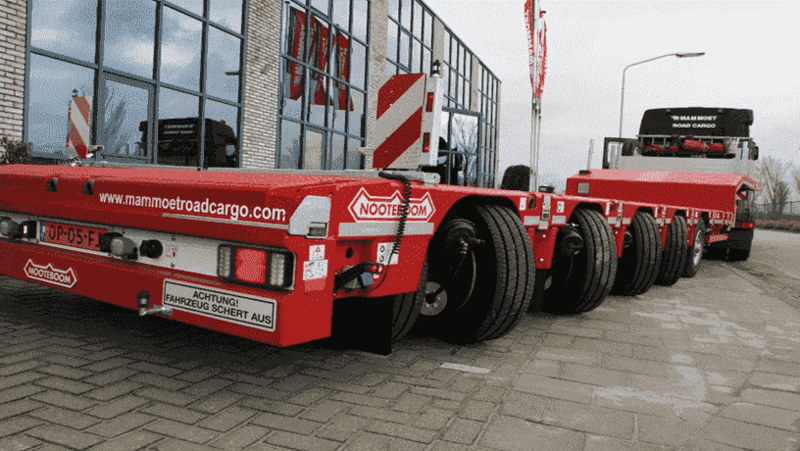 They have taken on board two new five-axle extendable MANOOVR trailers from Nooteboom. The new trailers are robust, innovative and designed specifically to meet the requirements of the exceptional transport industry. The semi-low loader features unique suspension and a 70 degree steering angle on pendulum axles, allowing an axle load of 12tons, the highest permitted in Europe. More importantly, the MANOOVR is the only semi low-loader that can actually get a 12t. axle load in Netherlands. This is the most modern equipment, and comes with all the newest safety features available. This type of trailer has a 64t. carrying capacity and an ultra-low driving height of 85cm. In the lowest position the deck height is only 78cm and with the amazing stroke of 50cm it can by raised up to 128cm. The trailer floor can be extended from the first axle, creating a length of 8 to 15 meters. Furthermore, it is equipped with a Safety-Walk anti-slip coating , TUV certified lashing eyes and ramps.This addition to the fleet provides an adaptable solution for exceptional transport projects in an increasingly demanding industry. The second Mammoet Road Cargo Manoovr will be on display at the Bauma, taking place from 11 to 17 April in Munich, Germany at the Nooteboom stand, FN824/1.